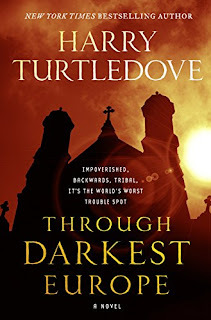 Harry Turtledove's Through Darkest Europe tackles religious fundamentalism, prejudice and violence through his classic use of an alternate history world. A pair of investigators visit a notorious backwater and corrupt portion of the world, a part of the world that resists coming into the modern era. The local autocrat is trying to hold down religious fundamentalists from running amok, women are expected to be seen (but covered up, of course) and not heard. Prejudice, racism, sexism and violence on the streets are a daily event. You probably already are imagining some place in the Middle East, or Central Asia, perhaps. You could likely see the investigators in your mind eye, maybe played by Chris Pratt and Tom Cruise. Americans abroad, helping democracy and freedom. But since this is a Harry Turtledove alternate history novel, you would be wrong. The place is the Grand Duchy of Italy, in an alternate world where Europe is the backwater, and the investigators are from the civilized republic of the Maghreb of North Africa, in his latest novel, Through Darkest Europe. The novel relies mainly on the setup, the world and the characters much more than a high throttle plot to propel the narrative. The two investigators come to Italy and get into trouble of all kinds, caught in the midst of secular and religious violence. Khalid, the Muslim, reaches across divides to find a relationship with a local woman,Annarita ,who struggles against the prejudices and backwater nature of her homeland. Dawud, is a Jew, and even in the modern world, still suffers prejudice there, and even more within the Grand Duchy. His is the older, mordantly funny observational type, a nice contrast to Khalid as lead. Turtledove carefully have Khalid note that in a more just world free of all prejudice, his partner would be the senior one. In that line, too, this is not a “better” world by any means, although I have some unanswered questions about the world. With the center of civilization switched from Europe, history has rhymed if not repeated from our world, with devastating wars between Iran and Iraq mentioned. There is also mention of a Holocaust like genocide of millions of people, but it is not a Jewish Holocaust. His alternate world’s Dar Al Islam may be as advanced and modern as Europe and America in our world, but it is not and hasn’t always been peace and roses since the rise of Egypt, the Maghreb and the other nations. And yes, friends, since this is a Harry Turtledove, there is a tuckerization, something I have spotted in his work since the days of realizing who a used car dealer in The Case of the Toxic Spell Dump was in our world. This time, the tuckerization I spotted was of a famous SF character, an alternate history character no less. I got a chuckle out of that. This novel is not quite like Matt Ruff’s The Mirage (one of the books that explores this novel’s theme in a different way) in that regard which is replete with parallel versions of characters from our world. Turtledove can and does play with the net fairly high up. Ruff’s The Mirage doesn’t bother to try and figure out why the Middle East is civilized and America is a backwater, he just goes with it. Turtledove’s two small changes in the philosophy of a key scholar in Europe, and one from the Islamic World is enough to put things on a very different course. And truthfully, some of the descriptions of what The Grand Duchy of Italy pulled at my heart in the same way that I felt when ISIS wrecked the ruins of the city of Palmyra. Italian heritage of their ancient sites is poor and the description of the neglect of those places in Rome, a couple of which I have seen for myself, was devastating. If the author meant to invoke the destruction of Palmyra explicitly, then for me, he succeeded. 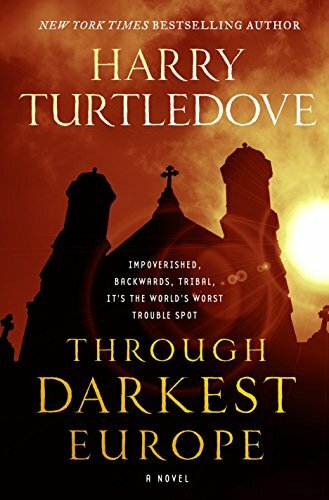 I think, if anything, Turtledove could have been even sharper and more poignant in his flipped world and missed a couple of chances to do so. Since the novel almost exclusively takes place in peninsular Italy, I wonder if in Turtledove’s world that not only are the glorious remnants of the past falling down, but why haven’t they long since been sold off. Maybe a comment or two about Roman statues transplanted to Tunis or Alexandria. Heck, there is a mention of the obelisk in front of the (sadly very crumbling) Pantheon in this world. I’d think that if Egypt was a powerful country in the civilized world, they’d long since have put a lot of pressure on the Grand Duchy of Italy to give back the dozen or so obelisks the Romans carted off from Egypt two millennia ago. The very secularized North African nations of Turtledove’s world, I think, would have a higher appreciation for artifacts from before the time of the Prophet and seek their return. There is stated admiration for the Roman ruins at Leptis Magna, for example, showcases this. All in all, however, some of the value of Turtledove’s alternate histories is to see our world, or an aspect of what our world once was, through the lens of a timeline that never was and never could be. The book shows just how senseless religious fundamentalism really is, by showing that with just a couple of changes,the center of civilization could have been elsewhere, and the world turned upside down, with those forces of intolerance hate taking root elsewhere. Penalties: -1 for unignorable weakness in plot and story.